Asti is a city and municipality located in the Piedmont region of north-western Italy, about 55 kilometers (34 miles) east of Turin in the plain of the Tanaro River. It is the capital of the province of Asti. The city lies in the middle of the famous hills, between the Langhe and Monferrato districts, famous worldwide for their wines, and enjoys a favorable position in the heart of Piedmont. Asti is known worldwide for its wines, notably Asti Spumante: every year, in September, it hosts one of the most important wine competitions in Italy, called the Douja d’Or . The famous Palio is also one of Italy’s oldest historical events, which takes place in September and ends with a horserace. The area to the NW of the city, between the center and the Cathedral, is very rich in medieval palaces and merchants’ houses, many with monumental towers. Asti is known as the city of a hundred towers (although it actually had 120) several of which still stand inside the old city walls. The best known are the Tower of the Comentini (13th century), the octagonal Torre de Regibus and Torre Troyana (13th century), as well as the ancient Rossa di San Secondo , built during the reign of the Roman Emperor Augustus. Departing from Turin, our first stop will be the Torre Rossa and the Domus di Via Varrone, examples of the roman architecture. 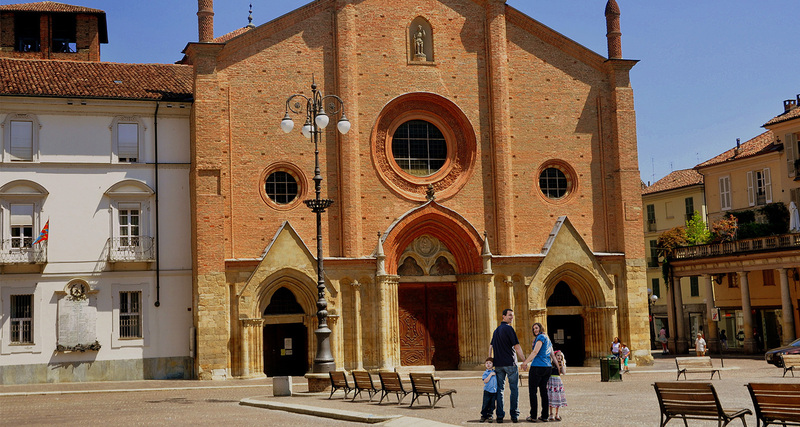 We’ll reach the giant Santa Maria Assunta Cathedral, that besides being the largest church in the region, thanks to its refined decorations is considered the most important Gothic cathedral of Piedmont. Along Corso Vittorio Alfieri we could admire the Cripta and Museum of Sant’Anastasio, example of the romanic period and Mazzetti Palace. Proceeding over Piazza Catena we’ll find the Torre Troyana, one of the most important example of the medieval architecture and the Church of San Silvestro. Down again in Corso Vittorio Alfieri we’ll reach Piazza San Secondo with the Collegiata di San Secondo and the Civic Palace. We’ll continue to Piazza Alfieri and Piazza della Libertà bordered by the Parco della Resistenza and the Square of the Palio. Very closed to the square are located the Confraternita della Ss Trinità e Sant’Evasio Church and Catena Palace. Back again in Corso Alfieri we’ll reach our last stop, San Pietro in Consavia Church, another example of roman architecture. Late in the afternoon we can finally visit a winery producing barbera, to savor one of the best italian wines. to taste food and wine specialty of the territory.